I have so many posts I've been wanting to write and this is one of them. 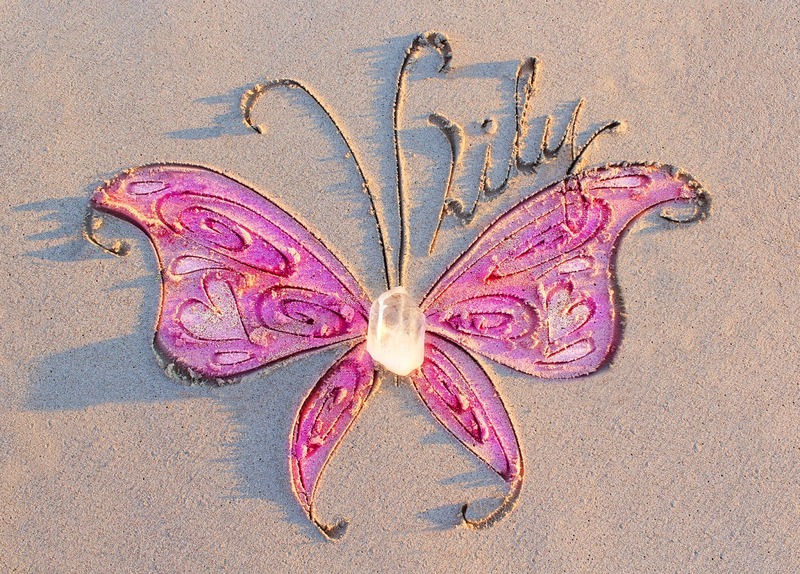 Lily's stone has officially been at her special spot in Crozet, Virginia since November 2013. It was possible because of the many generous and kind people who helped make it happen financially. I want to thank these people, those I know by name and those I don't know by name. I could never express the depth of my gratitude that friends, family, and complete strangers would bless me so tremendously in helping me do one of the last tangible things I can as a mother for my daughter of Heaven, Lily Katherine. Stacy Aube and her family who raised $823 (!) 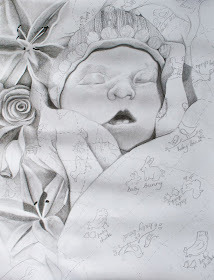 for Lily's stone through her Non-Profit organization she runs in her daughter's honor and memory, Baby Rachel's Legacy. Stacy usually hosts a 5K each August where she lives in New Hampshire, but in 2013, she decided that instead of doing a race that year, she would raise money to help me finish paying for Lily's stone. God put it on her heart to help, which was such a blessing in and of itself. And then I found out (on my 24th birthday of all days... God is always in the details!) the total amount that was being given and I was completely blown away! I never expected so much. Talk about the best birthday gift ever! Thank you to everyone who honored both Lily and Rachel in this way! 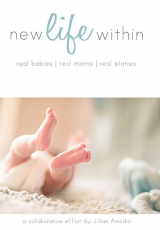 Click HERE and HERE to read the posts on Stacy's blog about Lily's stone. 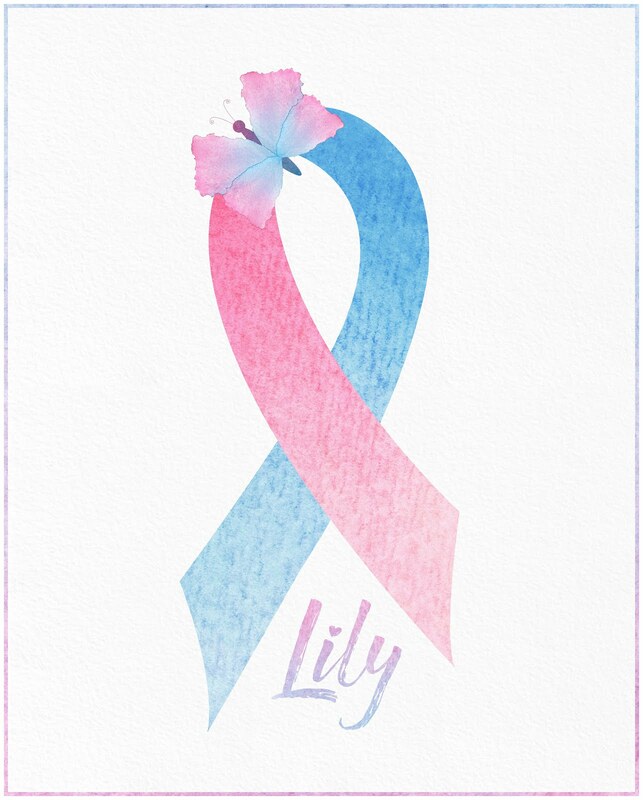 Stephanie Desjarlais who is an Origami Owl consultant offered to do an online fundraiser called "Lockets for Lily" where she contributed 20% of the profits raised to go towards Lily's stone. She ended up giving me a check for $77.20 and I was also given the blessing of a beautiful Origami Owl memorial locket with multiple charms of my choice, all for almost no charge (and these are not the cheapest of lockets, so I wouldn't have been able to get one myself otherwise). Thank you Stephanie, for blessing me in this way, and thank you to each person who bought something through the fundraiser. My friend Tracey's father, "Papa Dude," who unexpectedly gave me a card with $200 in it to help out with Lily's stone. Linda Znachko, from the amazing ministry, He Knows Your Name, who contibuted $100. These are the names that I have of the other people who gave on the GoFundMe page I had set up, as well as in person or online, from a little bit to a lot, but really the dollar amount is not what matters to me: Brittany Mays, Suzie Smyth, Morgan Lennon, Lisa Collins, Jennifer Kehoe, Candy Rhodes, Josiah Cadle, Sarah Miller, Kelly Osborne, Angela Welliver, Melissa Lorang, Natalie Mardon, Nancy Schuck, Elisha Cooper, Judith Harder, Nancy Auclair, Lacie Zoller, Michael Cornish, and all of those who have chosen to remain anonymous (I apologize if I have forgotten anyone). 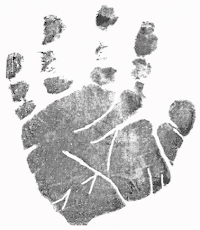 I am so humbled that others would do this with and for me, for her. 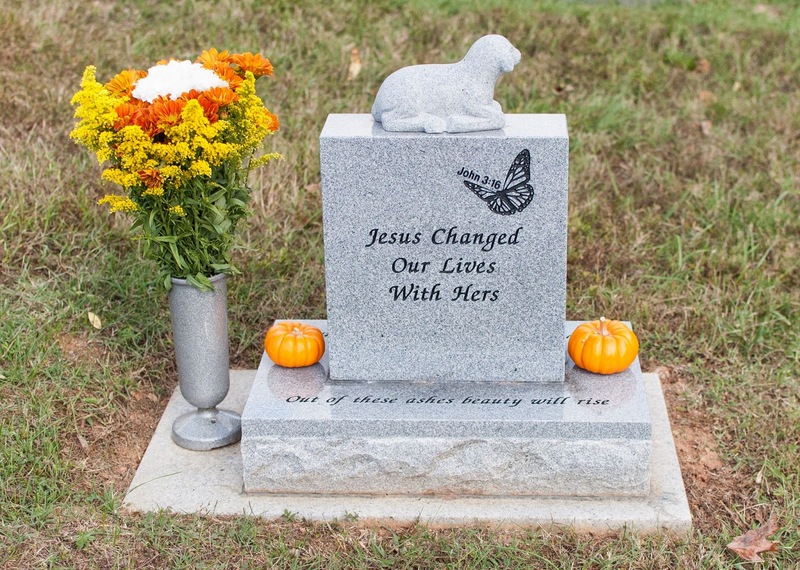 It means so much to me to have given her a stone as a way to bring dignity to her life. It hurt that I could not get one for three years because of finances. God led me to a wonderful monument company across the country in Seattle, that custom-created her stone, more wonderfully than I imagined possible. And then He led me to go ahead with the process of getting her stone, though I honestly had no idea how I'd pay off all $2,160.58 of it, including shipping from Seattle to Virginia. I knew He would provide, but didn't know it would be through so many people from literally across the world, from the United States, to Ireland, to the United Kingdom, and Switzerland. I worked hard and payed some as I was able, but then God blessed me abundantly with my baby girl's stone being completely payed off. It's amazing that He would put it on so many people's hearts to give! If my calculations are correct, a total of $1,470.20 was donated! He showed me afresh through each of you who gave that He loves Lily even more than I do and that He's still in the details, even all these years later. He's still blessing me for my choice of life. 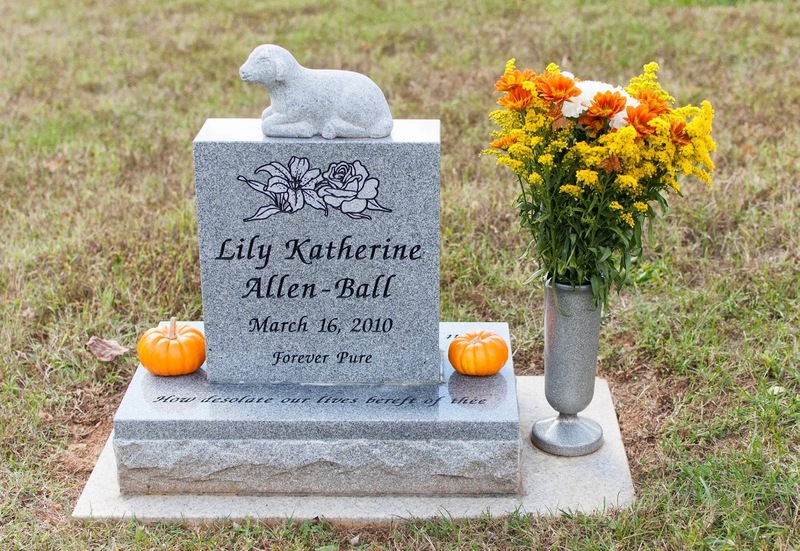 I would love it if each and every one of you could see Lily's stone in person one day. Some of you have already seen it and some will get to in the future. 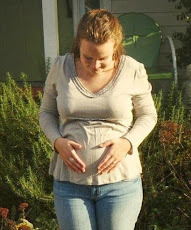 :-) But for those of you who cannot, I am so pleased to be able to share photos of her lovely stone. It is simply perfect for my beautiful girl. I never felt like I had to "settle" for less than what I feel she deserves. I cannot express the peace it gives me knowing my baby girl is finally honored in this way. It was like a heavy weight was taken off my shoulders on the day her stone was finally installed. It has been precious for me to decorate her spot for different holidays and seasons, and especially for her birthday. 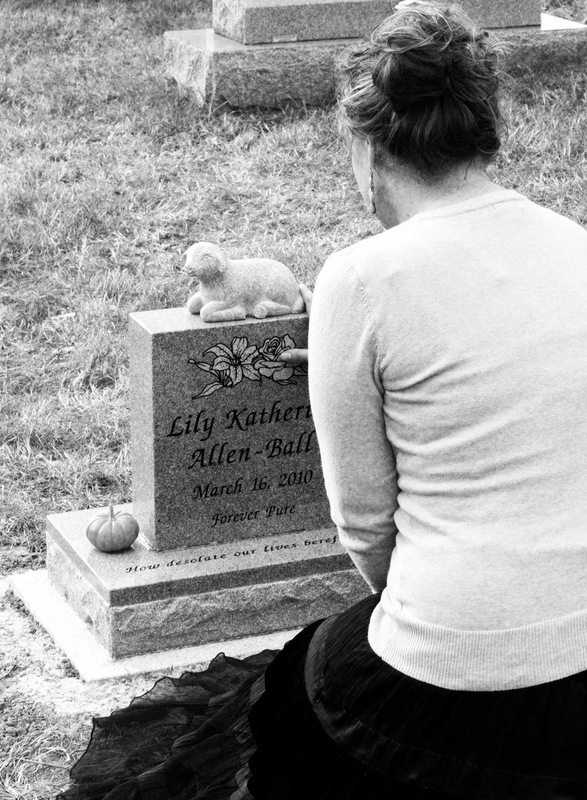 Each time I look at Lily's stone, my heart remembers the people who have been a part of this. It makes her stone that much more special. Again I say, thank you. 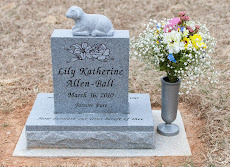 Click HERE to read more about the meaning behind Lily's stone. 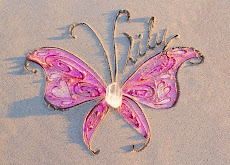 Click HERE to read all the other posts about Lily's stone.